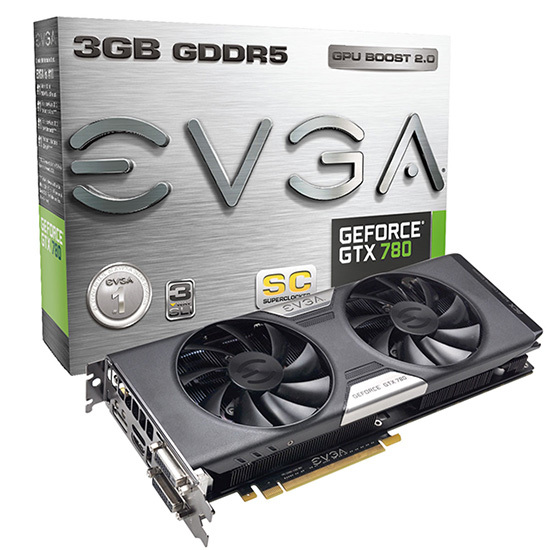 HEXUS has teamed up with EVGA and NVIDIA to give you the chance of winning the newly launched EVGA GeForce GTX 780 Superclocked graphics card featuring EVGA’s brand new ACX Cooler. The EVGA GeForce GTX 780 marks an evolution in gaming performance – an insanely fast, smooth, and whisper-quiet experience, every time. EVGA is also introducing a brand new cooling design: the EVGA ACX Cooler. This double ball bearing design redefines traditional enthusiast coolers. Starting with a 40% increase in heatsink volume, the EVGA ACX is more efficient at dissipating heat, allowing for 15% lower GPU temperatures. A reinforcement baseplate maintains a straight PCB, and helps lower mosfet temperatures by 7% and memory temperatures by 15%. EVGA has also invested in high quality fan blades – with a 700% increase in strength, and 25% lower weight when compared to competitors’ dual fan designs. This makes the fans 20% more efficient by requiring lower power levels. Of course, EVGA is also using double ball bearing fans which offer a 12 year lifespan – this is 4X longer when compared to competitors! Get pure performance today with the EVGA GeForce GTX 780 with ACX Cooling. Learn more about the EVGA ACX Cooler here. FB Link doesn't seem to work. Lovely comp though. Thanks guys. The Facebook post about it has disappeared too, think they changed their minds and made it website only. Facebook is now fine. What is the specs of this? Should all be working - the joys of scheduled activations!